Build Enough Bookshelves: Project Conversion: MY FIRST. GIVEAWAY. EVER!!!!!!!!! Project Conversion: MY FIRST. GIVEAWAY. EVER!!!!!!!!! As you can read here, I followed Andrew Bowen during Project Conversion, his year-long journey of self-discovery and immersion in other religious faiths. And as you can read here, I thoroughly enjoyed the book that Andrew wrote chronicling his life-changing experiences. 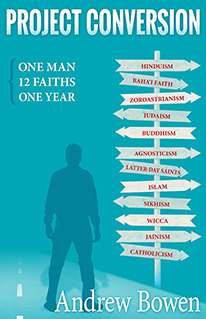 And now, Andrew has graciously provided a paperback copy of his book, Project Conversion: One Man, 12 Faiths, One Year, for a giveaway to one lucky reader! (b) Like my brand new Facebook page for Build Enough Bookshelves and leave a comment here telling me you did. (c) Become B.E.B. 's Google Friend by clicking the "join this site" button on the right sidebar (see the example below) and leave me a comment letting me know. This giveaway is open to US residents age 18 or older. Entries will be closed at midnight (Pacific Time) on Friday, March 29. Any comments on this post after that time will not be included in the drawing. The winner will be selected via random drawing, and will be announced in a blog post here and on the Build Enough Bookshelves Facebook page by the first week of April. The winner will have 72 hours to email me with his or her mailing address, otherwise a new winner will be selected. Let the commenting and liking commence! I envy meditation from Eastern traditions. And the Jewish concept of God and the open discussion they seem to foster about religion. Please message me or post here clarifying who you are, so I can contact you if you win! I like to concept behind lent of scarificing. I also am jealous of faiths the focus on nature and use that as their closeness to God. I liked your Build Enough Bookshelves page. Thanks, Emily, for always providing so many potential reads. The giveaway is now closed to entries. Thanks to all who participated, and the winner will be announced on Monday!